I know, right? 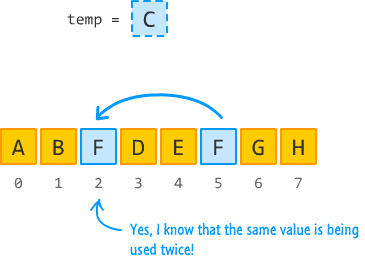 In this short article, I will show you how to easily swap items in an array. Before we jump to the code and actually answer what you are probably here looking for, let's take the scenic route and try to understand how to actually swap items from scratch. What we just did is re-create the steps of a swap operation by using a temporary variable and some simple array shenanigans. The code for doing all of this is pretty straightforward, so let's quickly look at that next. Finally. We get to the part that you were waiting for. I'm going to provide three variations of a swap implementation for the approach you saw described in the previous section. 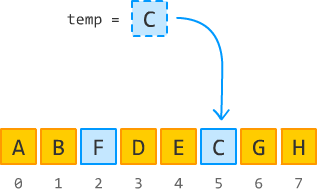 This approach continues our earlier example by having you swap the contents of the items in the 2nd and 5th index positions. 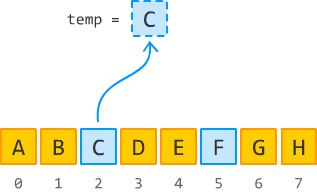 When you pass these three arguments in, the end result is that your specified array will get the items at the specified index positions swapped. Yay! Yes, extending built-in objects may be a bad idea! Some of you probably find the idea of extending a built-in object like Array to be a bad idea. After all, what happens when the swap method on Array is officially implemented or overwritten by a library? These are valid concerns, and ones that you should pay attention to. Personally, I extend objects all the time, but I give them a more unique name such as kirupaSwap for this case. That greatly reduces the chance of someone else inadvertently stomping over what I've extended. This entire article could have been written in probably 1/3 the space it ended up taking. With that said, it's good to savor the finer things in life...such as unnecessarily elaborate explanations on how to swap items in an array.